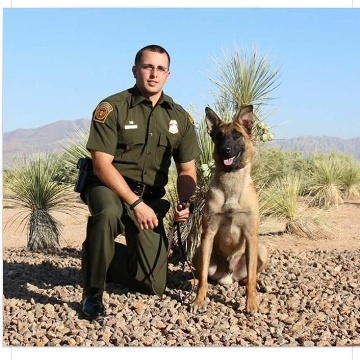 Border Patrol Agent Jose Barraza was killed in a vehicle crash on I-10, near Fort Hancock, Texas, at approximately 7:30 am. He was nearing the end of his shift when his patrol truck collided with the rear of a semi near mile marker 78. Agent Barraza was killed at the scene. His canine partner suffered minor injuries. Agent Barraza had served with the United States Border Patrol for almost eight years and was assigned to the Sierra Blanca Station. He is survived by his wife, two sons, and mother. My heart is and has been in complete shambles the last few years, weeks and days since you left. However, today I feel the same effects and emotions as I did 3 years ago when you were taken from us. People say it’s gets “easier” but I have to say it’s been harder because the cloud and fog is gone and I feel every emotion. From the beginning to the end of April is a constant hell of emotions. I miss you dearly my son. I love you more than my own life. I’ve prayed for God to take me and bring you back, but nothing works..the answer is still NO. I sware I HATE this New Normal. I miss my family the way it was before. I’m completely mad at God and can’t seem to shake that. I have a lot of support from friends and the family that’s left. However, the only ones who really understand is “get it” is the other parents. Mijo, I’ve met plenty of wonderful people since you were taken from us. However, I’d give it all back just to have you with us again. I love and miss you son beyond any thing imaginable. Can’t wait to see you again.